"A tale that had to be told ..."
"Drama of the highest order ..."
Enzo Ferrari’s Secret War discloses the existence of a genuine friendship built up during the late War years between Hoare, a young soldier in the Allied forces and the older Italian industrialist. This friendship led to the New Zealander doing Ferrari an enormous favor, one which enabled the marque to become established in the way it did, and which is revealed for the first time in this book. The first part of the book – and the one that will prove of greatest interest to readers outside New Zealand – describes Enzo Ferrari’s war years. The story of how Ferrari was able to fend off the attentions of three conflicting groups is drama of the highest order. Its telling is a world coup for David Manton. The book is packed with photographs, many from Hoare family sources and never published before." "... the foundation of the Ferrari legend"
“David’s research in Italy and New Zealand has uncovered previously unknown facts including saving a famous engineer’s career and probably his life. That engineer’s designs became the landmark, breathtaking cars, the foundation of the Ferrari legend." "Enzo Ferrari's War ... not an easy ride"
“Author Manton has gone to great lengths to back the claims made in his book, talking to many who knew Ferrari in this period, and to Italian local historians who supplied additional verification. The result is a colourful portrayal of the carmaker’s life, and those of some of his closest associates, during a time of deep mistrust between the variety of political factions, both official and highly informal, operating in wartime Italy. Any day it could all be ended by an assassin’s bullet, and in many instances it was. The book shows that Enzo Ferrari’s war was not the easy ride a respected industrialist might have expected. New Zealanders especially and Ferraristi everywhere will have heard stories that racing driver Pat Hoare had some sort of “special relationship” with Enzo Ferrari, enabling him to buy single-seater ex-F1 cars at a time when official company policy no longer allowed this. Manton explains how the relationship was forged, and the debt Ferrari felt he owed the New Zealand driver. "...integral to the Ferrari legend...highly recommended"
“I have read the book and it is well worthwhile. However, I think it would be fair to say that the Allies helped him more than he helped the Allies. By that, I mean that the book is really about New Zealander Pat Hoare, how his actions influenced not just Ferrari's personal and business survival, but also the post war fortunes of Ferrari and how Ferrari demonstrated his gratitude to Hoare. I don't want to "give up" here how that came about, as that would spoil the book. David Manton has done a lot of research, especially with his interviews with primary sources in Modena, Maranello and in New Zealand. I learned a lot from the book. Most interesting to me was how Ferrari walked a very fine line before, during and just after the war, keeping his company going while trying to satisfy the conflicting interests of the fascist government, the (mostly) socialist workers and unions, the Resistance, and eventually the occupying armies of Germany and then the Allied forces. He could not be seen as overtly favoring one over another, as at that time in history he could have lost his life as well as his business and his fortune. As Yates suggested in his biography, there was a connection with Third Reich industry but it was not nearly as sinister as implied in his book. For me, the author (of Enzo Ferrari's Secret War) was able to impart what it must have been like to exist in a small town in rural Italy during the turbulent times from the rise of Mussolini, through the war, and eventually post-war recovery. Manton has done a fine job of recreating the atmosphere. There are many details about Ferrari's life that are newly described (at least to me), as well as very interesting material about many of his contemporaries such as Eduardo Weber, Colombo, Count Trossi, Ugo Gobbato, etc. The book is also the story of a particular Ferrari, one of the most famed and traveled of all, as well as the story of Pat Hoare, someone who until now was relatively unknown, but who was integral to the Ferrari legend. I highly recommend the book." "One of the more entertaining books that I've read in years..."
“As a Ferrari owner, I find that one inevitably has to become a bit of a historian, in order to better understand the origins of the "mystique" which we are all a little part of. One would have found relatively little available regarding Enzo Ferrari's affairs during the Second World War; even the fairly recent Italian biopic about Ferrari glossed over that era quite briefly. Well, David Manton's new book goes a long way to filling the gap in the history. This is truly nonfiction that reads like fiction, and one of the more entertaining books that I've read in years. I found out about it on the "book collectors" thread, and I'm glad I did! Of course, one has reason to doubt whether this is really nonfiction, but Manton evidently went to the sources and interviewed just about everyone still alive who was part of that era, and he quotes those sources, in some cases verbatim. While the passage of time may have dulled some memories, I'm inclined to believe that most of what is written here is true. It should be pointed out that only about 1/3 of the book actually deals with the wartime activities. A second third deals with Enzo Ferrari's unique relationship with a New Zealander named Pat Hoare, who as a soldier in Italy was credited with saving the life of Ferrari's engineer Colombo, without whom the postwar history of the company would have been very different. Ferrari's gratitude towards Hoare resulted in some extensive favors, even more so than he ever granted any of his direct employees, including his World Champion drivers! Among these were two ex-works Grand Prix cars - a type which Ferrari usually scrapped when their racing days were over - and what happened to them subsequently. One was actually converted to two-seat GT car and eventually back to its original configuration, and all of that is described here in great detail. The last third of the book goes more generally into Ferrari's favorable relationship with New Zealand racers over the years, including how Chris Amon became one of Enzo's favorite drivers (after beating out another well-known Kiwi for the position - someone you wouldn't expect), and describing the successful Tasman Series campaigns of 1968-1970. There are many other anecdotes regarding New Zealand cars and personalities. "I could not put it down ..."
“I purchased the book "Enzo Ferrari's Secret War" at Hampton Downs race track this year and when I started to read it, I could not put it down. I especially enjoyed the detailed history of racing Ferrari cars that came to New Zealand. Having owned a Ferrari for some years ... thanks for a great read!" "This is the book that will explain Ferrari to people...this is required reading..."
“I'm in the middle of your book & I have to say it's incredible. All these years, people have accepted Ferrari (the man) as being who he was as a result of racing, his business, his drivers and his emotions or problems with the same. That's bull. That completely misses the man's life outside of cars! I always thought that there was something missing in the way of what made Ferrari who he was - political,crafty, dare I say a little underhanded, mercurial, somewhat suspicious, but ultimately aware of who he could trust, etc, - maybe with a few misjudgments along the way. "The book should be part of every Ferrari enthusiast's library"
“Somehow, Prancing Horse (quarterly publication of the Ferrari Club of America) missed the opportunity to review this book when it was published in 2011. A friend sent it to me, and I thought it significant enough to make FCA members aware of its contents. “Author David Manton might have asked himself the question, “How was New Zealander Pat Hoare able to buy a 246 F1 from the factory when others, including factory drivers, couldn't?“ In answering this question, Manton's extensive research uncovers and discusses many complicated situations and circumstances but comes up with few answers, making for an entertaining, if not contentious, book. It shows a little known and mysterious side of Enzo Ferrari that's been whispered but rarely spoken aloud in 66 years. “Three main periods are discussed: Ferrari's activities in WW II, his relationship with Pat Hoare and the cars he provided to Hoare, around which the book pivots, and motor racing personalities and their cars in post-war New Zealand. “I wish I’d paid more attention in history class to better remember all of the players during Ferrari’s war years, including the Fascist government, the Socialist workers and unions, the Resistance, occupying German army and the Allies. Ferrari, as did many Italian industrialists of the time, played both sides of the aisle to satisfy the many conflicting interests at play; favorites could have meant losing his business or his life. In his 1991 book, Enzo Ferrari: The Man, The Cars, The Races, The Machine, Brock Yates wrote of Ferrari’s connections to the Third Reich, so that’s not new information. Enzo maintained the appearance of a Fascist supporter but, at the same time, quietly (covertly) assisted the Resistance. One must give Enzo credit for walking the tightrope that kept him out of jail or a coffin, emerging post-war to become a major force in the industry. “Enter Pat Hoare a young New Zealand soldier in Italy with the Allied forces. Prior to his service, Hoare had an interest in motor racing. As the war wound down, he and Ferrari developed an unlikely bond and friendship - probably because Hoare saved the career and possibly the life of Ing. Gioachino Colombo. Manton postulates that Enzo felt indebted to Hoare for saving his key engineer’s life. Think about it. How different would things have been if Colombo had been slain? 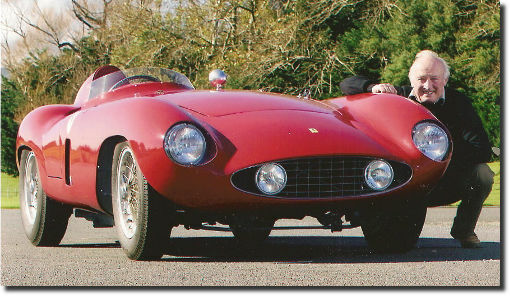 Ferrari would have been without the famous Colombo V-12 engine that carried his company for so many years. “Ferrari allowed Hoare to purchase two ex-works F1 cars: a “special” based on a 625 monoposto chassis and the 246 F1 with which Phil Hill won the 1960 Italian Grand Prix, fitted with a 3.0 liter V-12 engine. Manton believes Ferrari repaid a debt to Hoare by selling him ex-factory cars headed for the scrap yard according to Ferrari’s official policy. “Every soap opera needs a romantic interest so enter Rita, an attractive 18-year old Italian girl adding to the intrigue and secrecy. Hoare carried on a romance that lasted some seven years after war’s end with the young woman some believe to have been Enzo’s illegitimate daughter. That certainly could have been a “hook” for Hoare’s relationship with Enzo. “Manton’s research was comprehensive - he acknowledges and testimonials from 271 individuals and organisations. He talked with those who knew Ferrari at the time, including many Italian locals and family names in Ferrari history such as Carlo Benzi, Ezio Bompani, Mauro Forghieri, Carlo Tazzioli and others, collecting valuable testimonials and anecdotes. Adding a bit to the intrigue is the fact that several interviewees wished to remain anonymous. “A number of interesting and rare photos complement the text. Many were snapshots never intended for publication and didn’t reproduce well. They were, however, integral to telling the story, most notably those from the Hoare family. Manton backed up his research with an extensive bibliography and an excellent index. “The third portion of the book completely departs from the secret life of Enzo Ferrari. It combines anecdotes and memories from New Zealand motorsport personalities, including Chris Amon who was one of Enzo’s favorites, to describe motor racing in New Zealand during the postwar years following Pat Hoare’s return from Italy. “While Manton doesn’t solve the mystery or even reach any definitive conclusions, he does uncover an immense amount of information that teases the mind and opens up many possibilities. Many of his pieces seem to fit the puzzle. To their deaths, neither Ferrari nor Hoare revealed the personal details of their relationship. Manton leaves that to our imagination but adds focus, context and meaning through his diligent research. “A librarian might have trouble classifying this book as fiction or nonfiction. One can find it a fascinating book with fascinating information that goes a long way to fill a gap in Ferrari’s biography that’s been heretofore ignored or glossed over - Manton spares no effort to ensure a balanced presentation. Or, one can reject the premises and information as sensationalism without founding. No matter, its a good and captivating read. “Full credit to author David Manton for taking on a difficult and controversial subject that’s sure to draw criticism . Like it or not, Manton opened an important window into the life of Enzo Ferrari, and the book should be part of every Ferrari enthusiast's library."